The first two official, non-production images of Star Trek: Discovery are out in the wild, and they showcase a new alien design as well as hint at a season that will begin, at least, with the meeting of the past and the present of Trek. Both of these images come from Entertainment Weekly, who’s doing a whole series of early looks at film and TV in advance of San Diego Comic-Con next week. 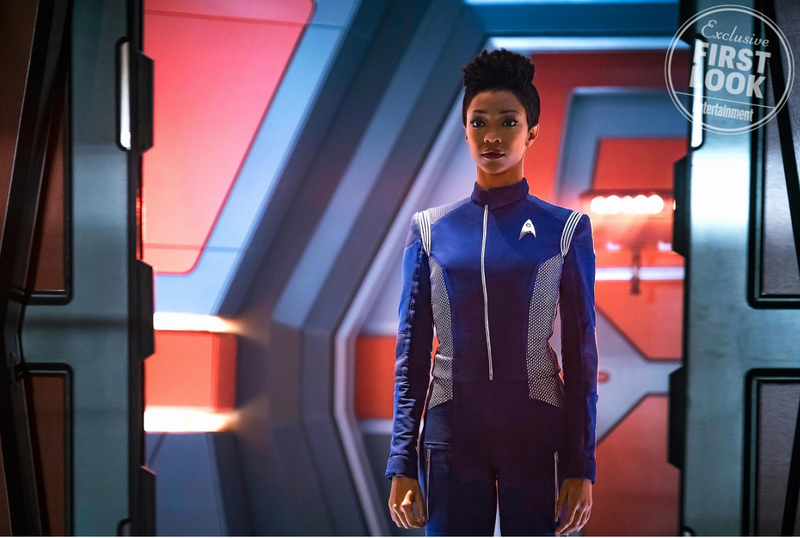 The first, from the EW online portal, shows Michael Burnham (Sonequa Martin-Green) walking through a pair of doors on the USS Enterprise. According to EW’s caption, this is Burnham walking onto the bridge of the Enterprise, although the Trek experts at Trek Movie speculate, based on a production video from earlier in the spring, that it might actually be Burnham walking into a room labelled 3F, which they think might be Spock’s quarters. 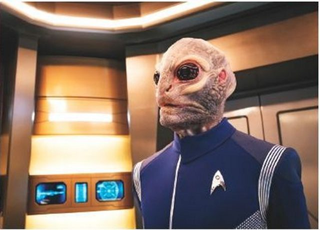 The other image, from EW’s print edition, shows a new design for the Saurian race first showcased in Star Trek: The Motion Picture, in the form of a character named Linus, who looks to be a science officer. Linus, a Saurian from Star Trek: Discovery. Trek Movie also transcribes some quotes from Martin-Green from the print issue. In one, she reveals the Saurian as Linus, and says, “We’ve seen his species before, so I’m excited to see if [fans] can pinpoint just exactly where.” Before in Discovery? Commenters, get busy.